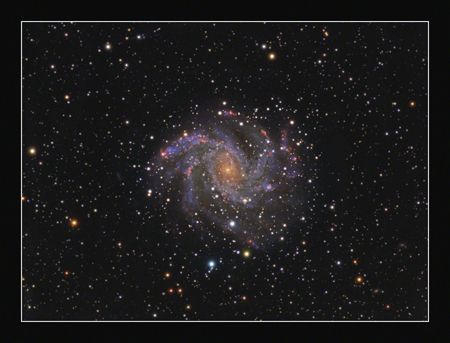 This is a faint face-on spiral galaxy located in the constellation of Cepheus and is about 10 million light years from us. It was discovered by Sir William Herschel on the 9th September 1798. It lies in the plane of the milky way, making it difficult both to observe and image, due to the large amount of stars and interstellar material in the way. It needs a lot of exposure, and I quite quickly ran into colour noise issues during processing, meaning that I really needed more subs to get a better signal to noise ratio. I got over the problem by careful use of noise reduction and individual pixel adjustment to even the noisy areas out. 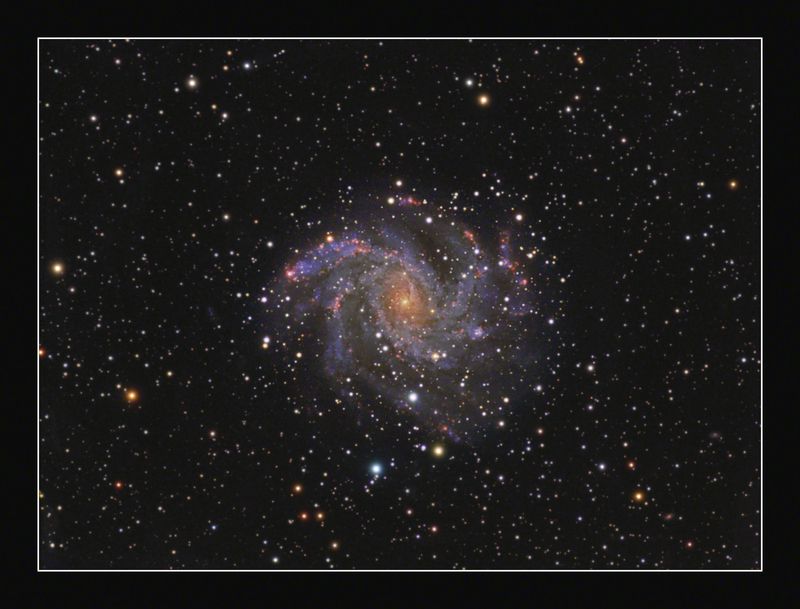 Processing this galaxy is also made harder by the amount of stars in the foreground. The galaxy itself requires a lot of stretching due to its faintness, but it is then very easy to lose control of the stars during this process, and end up with big bloated stars with little colour. H-alpha data was added to the red channel to bring out the striking HII regions of this aptly named and very colourful galaxy. Imaged on the10th, 15th, 17th, 27th & 29th August and the 8th, 11th & 29th September 2010 from Dorset, England. Ha. 16 x 900 seconds. Total imaging time. 27 hours and 5 minutes.